Transparency Market Research states the global market for sports food is expected to witness a progressive growth in the coming years due to rising focus towards sports and recreational activities among people. The presence of numerous players in the sports food market has made the vendor landscape to be highly fragmented. Prominent players are focusing on creating new food products with new and unique taste in order to gain more revenue in the market and stand out in the crowd. Additional nutrients and new discovery of flavors are introduced in order to give tough competition to their opposing counterparts. 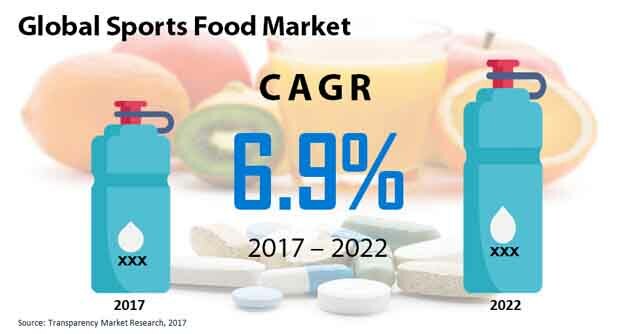 Some of the top participants of the global sports food market are Nestlé, Dr Pepper Snapple, Abbott Laboratories, GlaxoSmithKline, and Red Bull. Currently these vendors are putting more focus towards the developing nations in order to unleash the bag full of opportunities that lays in these regions because of lack of attention. According to the report by TMR, the global sports food market is expected to reach a value of US$88.76 bn by 2022. The forecast period is set from 2017 to 2022 and the market may be growing at a remarkable CAGR of 6.90% within this period. In terms of product, the market is dominated by the protein-based food products and energy sports as compared to their counterparts. In terms of distribution channel, the market is seen to be contributing major shares from online channels. From a geographical perspective, the global sports food market is likely to be having a lion’s share from North America with an accelerating CAGR of 7.70% during the forecast period. The market t contribution to the world from North America alone is projected to be worth US$36.73 bn by the end of 2022 from US$25.35 bn as per the 2017 records. The rise in awareness about health and hygiene have urged people to start physical activities again. The indoor gaming of past decades have again made way to staying outdoors and having fun recreational activities. Sports being the best physical involvement is boosting the market for sports food as the body tends to utilize all the essential nutrients and absorb them as per the body demands, thus providing a healthier lifestyle as compared to those who prefer to stay back home. The rise in urbanization also has a remarkable impact on the lives of people as lifestyle demands health club enrolments, and enrolment in gymnasiums and fitness centers. The increase in the number of gymnasiums and other fitness and health centers all around the world is boosting the overall market for sports food at a global level. Another factor fueling the sports food market is the efficient and innovative product development by vendors of sports food. The unique and massive advertising and marketing tactics have helped the sports food market to grow substantially. Thus high preference and consumption of sports food items have been surged in the past few years and will continue to increase with the advent of time. Other macro-economic factors like increase in disposable incomes and the surging employment of people and their interest and involvement in sports is likely to boost the future market of sports food in the future. The increase in the number of sports activities and global level competition like that of summer and winter Olympics is another important factor boosting the market for sports food all around the world. Fitness and health cautious people are also more into consumption of sports food and their preference is generating more revenue into the market in the long run. The above presented review is based on a TMR report, titled, “Sports Food Market (Product - Protein, Energy, Pre-workout, Rehydration, Meal Replacement; Gender - Female, Male; Distribution Channel - Online Stores, Hypermarket and Supermarkets, Convenience Stores, Drug Stores) - Global Industry Analysis, Size, Share, Growth, Trends and Forecast 2017 – 2022”.